Are you looking to improve your quality of sleep? Well, lets get ready for bed with this simple home-made room spray recipe. All you need is a few essential oils and some pharmacy favourites and you are on your way. It's no magic pill but it is magical. Note: We choose to buy and sell our essential oils from Divine Essence. 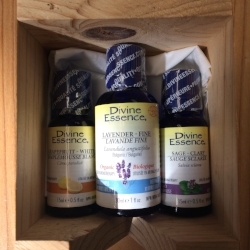 Divine Essence is a local Montreal based company, they are mostly Certified Organic and wild harvested oils and they have one of the greatest selection and quality of 100% pure oils available today. Add alcohol to your fancy bottle. Carefully add your essential oils counting as you go. Give it a swirl. Add water and re-attach the lid. Now Spray spray spray the day away. Note: It is essential to add the oils to the alcohol before adding the water for solubility purposes. Also, if you decide to get creative and use other oils be sure to use calming, clear coloured essential oils. For instance Orange essential oil is uplifting as a scent and has a colour that will stain your sheets. This recipe can also be used as a bathroom deodorizer or a middle of the day scent spray for your home or office. So relax into a slumber and enjoy this aromatic blend of oils made by you for you.